I approached the farm, slowed down early enough to spot a stranger in the herd. Little did I know there were two strangers. Words fail. Pictures will suffice. 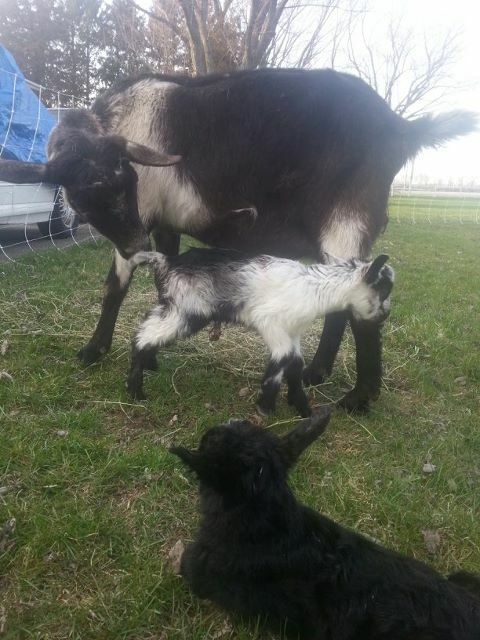 Congratulations to http://www.opiesgoats.com for the first two of many great additions to 2013! So this morning I went to the barn, milked Angel. Went to the pasture, watered, tightened the fence line, said my hellos to the goats and their new miniature donkey, George. Came back to the house, drank coffee, filtered milk, packed my lunch, jumped in the shower. As I got out of the shower I heard some noise outside. Opened the blind. There they all were. My goats, my donkey. Looking at me through the window. The goats had their hooves on the house, peering into the window. It was cold, mind you. Cold. I dressed. Barely. Didn’t grab my glasses. Just walked out of the house. Right past them toward their field. The goats followed. George, the donkey, well he quite liked the dirt border around the porch and decided to roll in it. I kept walking. He had the nerve to get up, rotate, and roll on his other side. He then got up and ran to join the group. All but my naughty goat Peanut followed me into their fence line. I wrangled her soon after, closed up the fence only to find the ground wire wasnt connected to the energizer (it electrifies the fence). I guess they wanted to find me, their mom. And they did. How did they know I was in the shower?